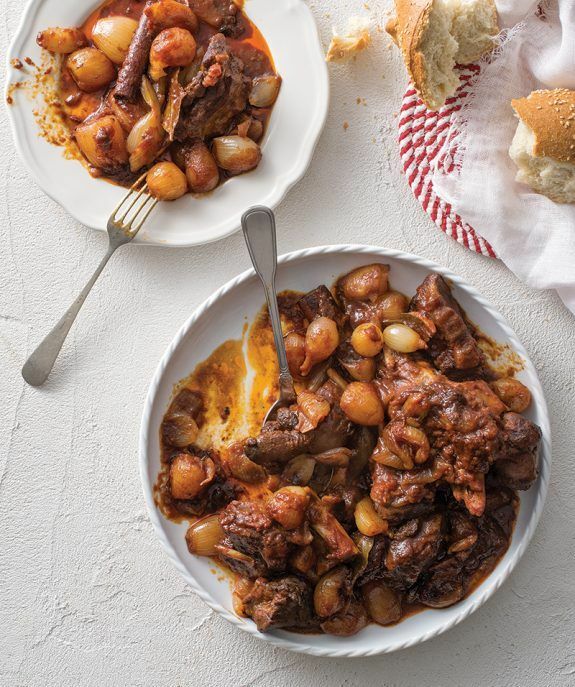 Stifado is a traditional Greek stew dish. All stifado dishes include onions – whole small boiler or pearl onions or larger. Although rabbit is a common Greek favorite, this dish can be made with meat, seafood, poultry or vegetable as the central ingredient. It is full of aromas because besides onions, wine, vinegar and tomato, it includes spices -mostly cinnamon, cloves and allspice- that create a most flavorful dish, perfect for a Sunday family meal. In an oven safe pan with lid heat half oil on medium heat and cook whole onions for 10-15 minutes until golden. Stir in garlic, cinnamon, cloves, allspice, bay leaves and cook on low heat until fragrant. Season meat well with salt and pepper. Dust with flour. In a large non stick frying pan heat remaining oil and cook meat on all sides until nicely colored. Transfer in the pot with onions. Scatter black pepper corns, cumin, sugar and season with salt and pepper. Stir in tomato paste, vinegar and wine. When alcohol evaporates stir in grated tomatoes, two cups of hot water or vegetable stock, and cover with lid. When it comes to a boil transfer in the oven. Roast for 2,5 hours or until meat is tender and sauce thickens. Every now and then take the pan out of the oven and move it on all directions, avoiding stirring and checking for water, too. Serve warm – if you want serve with a nice rice or mashed potatoes.